Here’s another wonderful kid approved chicken recipe from you guessed it, Ina Garten. I tend to make a lot of her recipes because they’re easy and they always turn out amazing. This particular recipe was from her cookbook, How Easy is That. I usually make a chicken dish once a week for my family as it’s economical, easy to prepare and my kids just love it. This dish was a bit messy and a bit grease splattering, but the smiles and thumbs up from my kids and hubby made it all worth it. I just found out an interesting fact about chicken skin here at my friend Em’s blog that you might want to check out. It’s made me re-think having an occasional bite of crispy skin. My kids were psyched that they got to eat their skin last night, as that is really the best part, right? This dish is paired with a shallot and lemon sauce that is amazing! I even rolled my popover in it after my chicken disappeared. The sauce really makes this chicken stand out, so make it! Lets get our ingredients prepared. 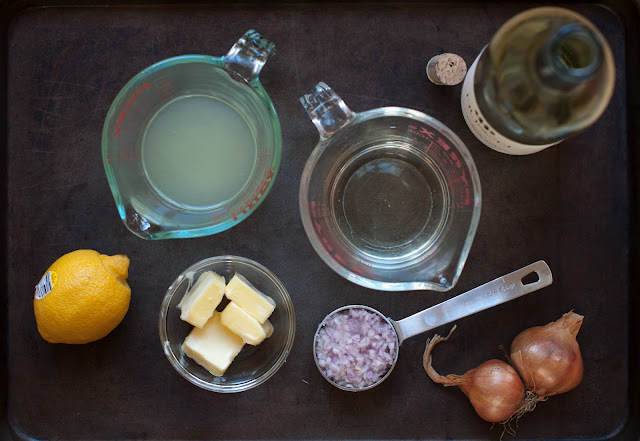 Mince your shallot, squeeze up your lemons to get your lemon juice, pour your 1/2-cup wine, slice up your room temp butter. Rinse and pat the chicken dry with the paper towels and sprinkle them generously on both sides with salt and pepper. Make sure that the chicken is dry, as that helps it to brown up in the skillet. In a 12-inch cast iron skillet or oven safe skillet, heat the oil over medium-high heat for 2 minutes, until it begins to smoke. Place the chicken breasts, skin side down in the skillet and cook for 4 to 5 minutes without moving, until golden brown. Raw chicken photos, gotta love them! The below photos show 2 chicken breasts, as I was making a smaller batch to photograph for you all. Using tongs, turn the chicken breasts skin side up and place the skillet in the preheated oven. Roast the chicken for 12 to 15 minutes or until the chicken is cooked through (when they reach an internal temp of 165 degrees). Please remember that this is an estimate on cooking time since chicken breasts vary in size. Keep an eye on the chicken and cook accordingly. Meanwhile (while the chicken is cooking), in a medium sauté pan, combine the white wine, lemon juice, and shallots and cook over medium-high heat until only 2 tablespoons of liquid remain in the pan, about 5 minutes. If the sauce reduces too much, add an extra splash of white wine or water. Honestly, just keep an eye on the sauce and you shouldn’t need to add any additional wine or water. Add the cream, 1 teaspoon salt, and 1/4 teaspoon pepper and bring to a full boil. Remove the sauce from the heat, add the diced butter, and swirl the pan until the butter is incorporated. Don’t reheat or the sauce will break! The sauce will be a creamy yellow and pinkish color. Pour your sauce into a small bowl and set aside until the chicken is finished. The sauce may not look pretty, but it tastes amazing! Serve up the chicken breasts and have each person spoon the desired amount of sauce over their breast, or you can pour the sauce over all of the breasts. We served these up with popovers and roasted cauliflower. Everyone in my family was part of the clean plate club. I even found members of my family lapping up the remaining sauce with their popovers. Zoe rated this dish a 10+++. Eli rated this a 10+++ as well. Yumalisious!! That is exactly what Madelaine had to say about this dish. Eliza didn’t have any comment because she was to busy “stuffing her face” with it. Grace wouldn’t try the sauce :(. And Zoe gave me props!! I’ll be honest, I’m not a big fan of the kitchen. Love to eat but don’t have the time to create beautiful meals. Anyway, the prep was longer than I typically have (you know, with homework, carpools for three kids and work), BUT I am very very happy that I made the effort. In fact, I look forward to branching out and making the occasional delectable dish from your blog. OH! Wanted to let you know that I steamed broccoli and we used the sauce on that, as well. Amazing! Hey Cathie. I’m so proud and glad that you made this recipe as Madelaine was begging for it. I’m happy that it was a partial hit (sorry Grace). I’m sure that Zoe was psyched to have this for dinner. I don’t make it that often either, because it is a bit labor intensive and can be a bit messy with the oil splattering everywhere. It’s a once a month fall and winter dish for us. I will hook you up with some easier family friendly dishes that your girls should enjoy. I think they will love the cilantro lime chicken that I am going to post on Monday. Its super easy because all you have to do is marinate the chicken in the morning and then throw it on the grill. Easy peasy. BTW, your hands are going to be on the blog tomorrow. Good to know this is another perfect 10 rating Barefoot Contessa recipe! Honestly speaking, I’m actually quite motivated by you and Ina Garten, I had actually nominated Ina Garten to be the theme of the blog hop for the month of May. Hope that we can learn lots of cooking and baking from her recipes. mmmm, looks great! I love that you use Barefoot Contessa recipes – it seems as though Ina’s recipes always turn out great. Nice work and pretty photos! As a side note, I live in the Tahoe area, so we’re just around the corner (3+ hr drive) from one another! Let’s hope for some snow in the mountains! You said it, what a crack-up! Last year we got more snow than anyone knew what to do with and this year… :sigh: well, there’s still time! Hope you had an excellent Super Bowl! totally gonna make this next week! I thought you would like this one Amanda! Aww – thanks so much for the shout out lovely!! And yes – your kids should totally get to eat the skin! I bet this was amazing – it looks a bit like the chicken piccata recipe on my site – which is one of our favourites EVER, only poss a bit less kid friendly, what with all the capers and such. BUT chicken in white wine and lemon …. pretty unbeatable. There is just something so satisfying about chicken dinners isnt there? And so happy to hear you always buy free range. We always try to (even when I wasn’t working and money was tighter) – except in the case of eating cheap Thai food out, when I just close off my concience and go for it with the chicken pad thai. 80/20 rule …right?! Hope you’re having a great week! PS – we’ve got your fennel and sausage bookmarked for Sunday lunch – wahooo! Hi Em! I might have to try your chicken piccata. My kids can just scrape off the capers if they don’t like them. They love chicken dishes with sauces. We only buy free range and organic meats. I am lucky because that is pretty much all that is sold around here. We also don’t really eat that much red meat and when we do it’s usually buffalo. I cooked up some buffalo burgers tonight because it felt like summer today and Zoe has been craving a burger. We make them min though and eat them on mini brioche buns! Yummmy! I am so glad that your making the fennel sausage pasta. Let me know how it turns out for you! BTW, I love that you said Who hoo at the end. I am known as the Whoo Hoo girl! What an elegant and delicious looking chicken recipe!